(Newser) – Fans who see troops honored at halftime events during NFL games may not be aware that a lot of the time, their tax dollars are paying for the tribute to the military. According to an NJ.com investigation, the Pentagon has paid a total of $5.4 million to 14 NFL teams since 2011 for events like the New York Jets' "Hometown Heroes" tribute to members of the New Jersey Army National Guard. 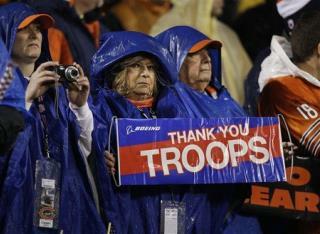 Most of the paid-for tributes involved the National Guard, and while not every NFL event saluting the troops is part of a promotion, some lawmakers say having teams compensated for patriotic events seems distasteful, Scout.com reports. So we have these hunting and fishing shows, wildlife shows, and gun shows at our local fairgrounds. You always see the national guard, army, marines, and airforce there with their wares such as Humvees, repelling walls, missile launchers, drone launch vehicles, etc. So you think its so nice that these agencies donate so much time and resources to these shows. Poppycock, they pay the show operators around $20,000 each to set up their big military displays. It helps bankrolls the shows and allows the show operators to personally bank the gate fees. If you have to pay someone to honor someone else, is it really an honor? It's sad, but I doubt anyone is surprised.